How about Business Recycling in Houston? Reading the recycling article in last Sunday’s paper had me wondering why the city concentrates on getting residents to recycle when there would be much more impact if restaurants and other Houston businesses were required to recycle. 1. Know your trash. Yes, it might be dirty work, but it’s worth figuring out what types of things your business tosses out – whether it’s white paper, plastic bottles or bags or paint cans. You can then better determine what part of your trash is eligible for recycling. Some items may even be required to be recycled under your state’s laws. 2. Contact your local recycler. Review your curbside recycler’s rules and the items and materials it accepts – assuming you have curbside recycling at your business. Many recyclers now pick up a wider range of plastics, cloth and linens and small appliances. Get a full list of accepted items and keep it handy. (Some city recycling programs are even starting to pick up business’s food scraps for composting.) Also keep in mind that some curbside collection programs don’t automatically stop at businesses – so it’s worth contacting them to find out whether they will. 3. Consider alternatives. Even if there’s no curbside collection for, say, old batteries and light bulbs, that doesn’t mean they aren’t recyclable. Check out Earth911.com to find drop-off recycling centers in your area and get lists of accepted items. (Some charge fees.) Several major retailers including Whole Foods, Home Depot, and Best Buy will recycle the types of products they sell – everything from plastic food containers to CFL light bulbs to old computers. 4. Make it easy. How easy you make recycling in your office will affect whether employees pitch in. Consider putting paper recycling bins under every employee’s desk and near areas with lots of paper waste, such as by copy machines and printers. Put plastic bottle collections in the break room. Clearly mark the bins so employees know exactly what should be put in them. Another possible motivation trick: Put trash cans farther out of reach. Well there you go. 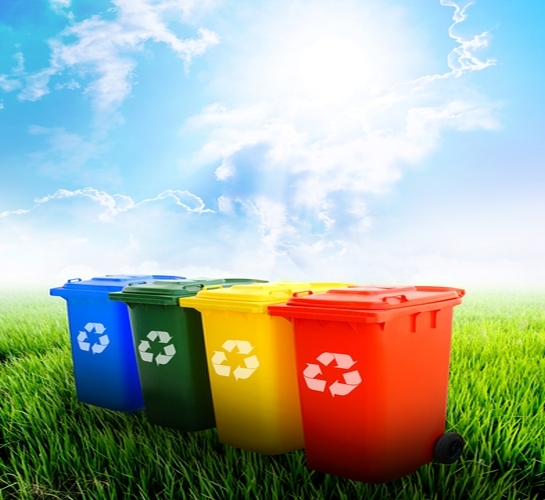 Several ways to recycle trash at your business, improve your community, and reduce waste. Thanks for the tips Kelly Spors!